What it is: A cooling eye cream that relieves puffiness to wake up tired-looking eyes. If you want to know more… Water Fuse Hydro Soothe Eye Gel is an ultra-hydrating eye gel-cream that provides lasting hydration, while reducing the appearance of puffiness with pumpkin extract, arnica, and bromelain. 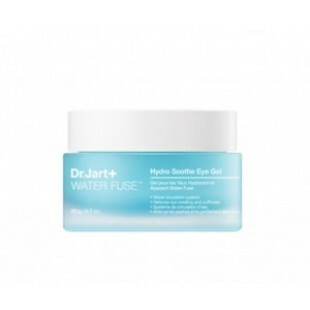 This formula contains a blend of AquaMinerals, which directs waterflow and helps maintain balanced moisture levels, visibly boosting firmness and elasticity. Himalayan pink salt supports natural cell regeneration, while Belgium hot spring water and natural barrier complex remove impurities from pores and provide soothing and antibacterial benefits. Aquaicia and oligo-HA hydrates to keep skin looking and feeling healthy and bright. Suggested Usage: -Before applying moisturizer, take a small amount with your ring finger. -Tap gently around each eye are a as if you are drawing a circle. -Allow gel to fully absorb.